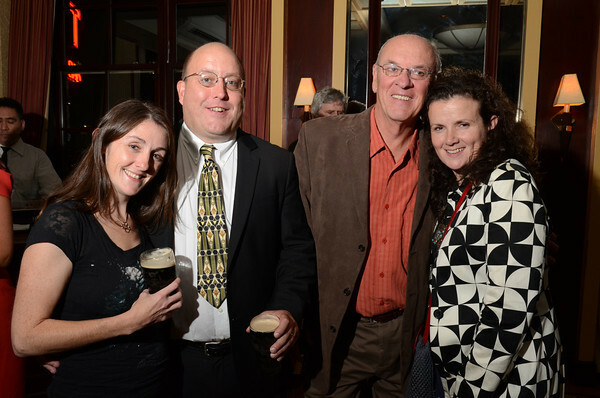 How It’s New York: The 2012 Eugene O’Neill Lifetime Achievement Award celebration took place at the Manhattan Club above Rosie O’Grady’s, a convivial Times Square fixture for almost 40 years, and a short walk from the birthplace of Eugene O’Neill. 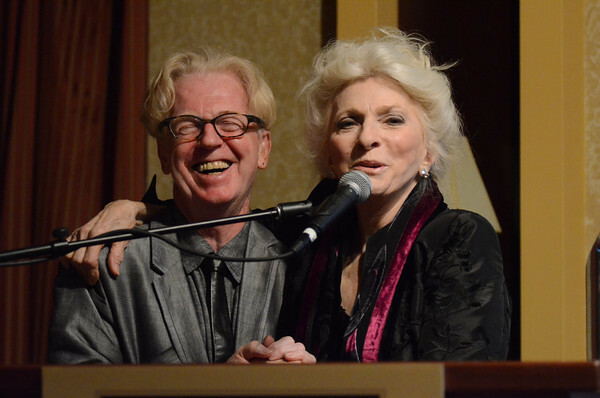 John Kearns reports on what was by all accounts a fabulous night as IAWA gave its Eugene O’Neill Lifetime Achievement Award to Judy Collins! IAWA has a NJ Salon coming up next week, Oct. 25. Are you a mamber yet? 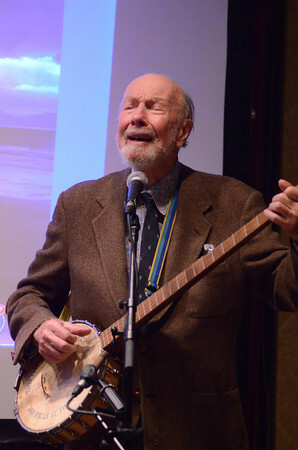 On Monday, October 15, 2012, in the middle of the one of the year’s great celebrations, the Eugene O’Neill awards ceremony, 93-year-old folksinger, songwriter, and fighter for civil rights, peace, and the environment, Pete Seeger, stood strumming his enduring banjo before a hushed audience of over 200. 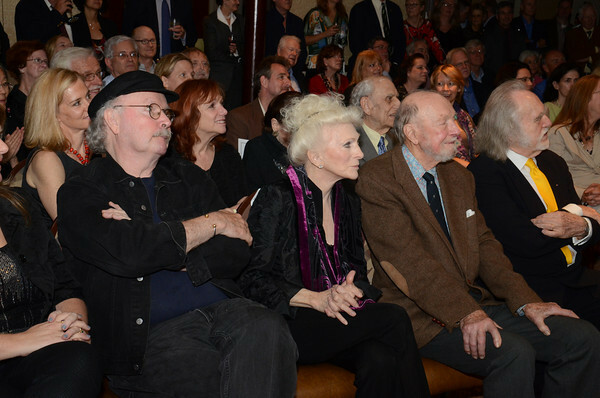 And the large crowd in attendance at the Eugene O’Neill Lifetime Achievement Award at the Manhattan Club above Rosie O’Grady’s on a rainy Monday night was testament to the truth of Seeger’s declaration. 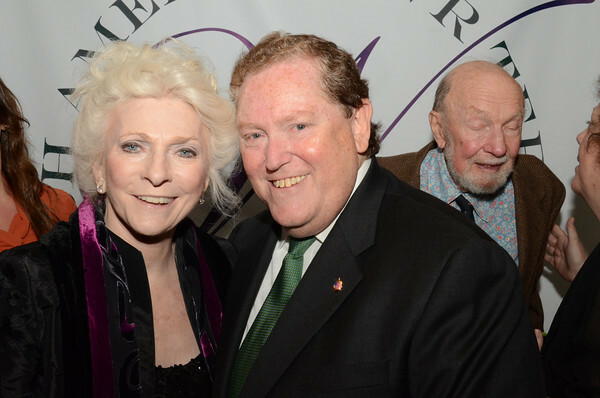 The crowd, representing all genres of the arts, had gathered to celebrate Judy Collins’s lifetime of artistic achievement and to show its commitment to further such achievement. The spirit of inspiration, encouragement, generosity, and cross-pollination was abundant in the friendly atmosphere of the Manhattan Club. 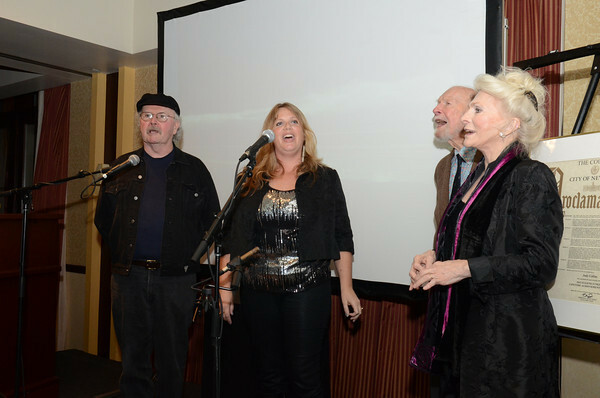 Indeed, Judy Collins’s long-time friend on the folk music scene, Tom Paxton, was on hand to honor her,. Even the City of New York showed its support for the arts: City Council Speaker Christine Quinn issued a special proclamation in honor of the event. In keeping with the musical theme of the evening, Black ’47 bandleader, author, and playwright, Larry Kirwan, acted as Master of Ceremonies. Larry got the ceremony started by introducing IAWA President, T.J. English. T.J. ,who has taken over the presidency from Peter Quinn, apologized for not being as eloquent as his speech-writer predecessor. T.J. updated the audience on some of the progress made by the IAWA over the past year, in particular the burgeoning success of the semimonthly Salons at the Café Thalia and the Cell Theatre. These evenings have become so popular that IAWA is preparing a third monthly gathering of artists to share their work with one another. T.J. also talked about the mission of the IAW&A and of the Eugene O’Neill Lifetime Achievement Award. The Eugene O’Neill Lifetime Achievement Award was established in 2009 to honor the accomplishments of a writer, actor, musician, or cultural institution that has sustained a body of work that best exemplifies the level of integrity maintained by O’Neill. 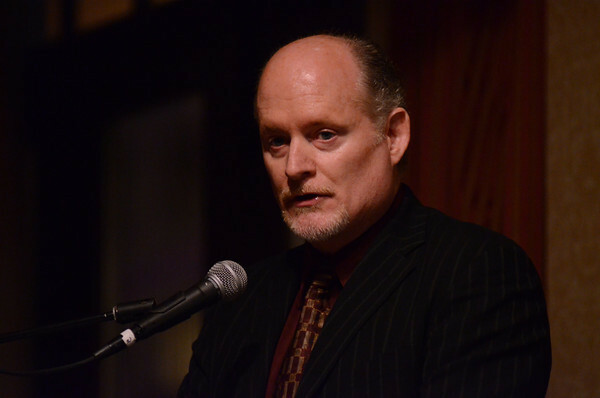 O’Neill Awards have been presented to Pulitzer-prize winning author William Kennedy, actor Brian Dennehy, and Charlotte Moore and Ciarán O’Reilly of New York’s Irish Repertory Theatre. 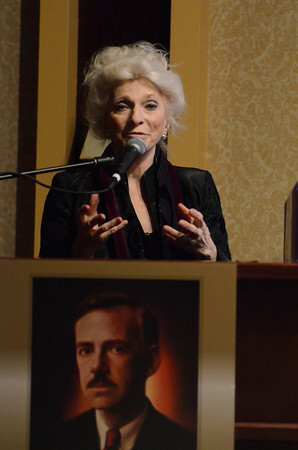 Judy Collins is the first musician to receive the award. Tom Moran said that he has no talent himself but he does have the ability to listen — not only with his ears but with his heart. Listening with both ears and heart, Moran explained, was necessary to appreciate the beautiful voice and the soulful emotion in the music of Judy Collins. He also praised Judy Collins’s work for Concern Worldwide, the Irish charity of which he is chairman. The film, featuring the Judy Collins’s voiceover taken from Charles’s interview with the folksinging legend, takes us through Collins’s life from childhood to the present, focusing on her mother and father, her son, her music, and her work for peace. The soundtrack on the film features the soaring song “Walls: We Are Not Forgotten” composed and sung by Collins with lyrics from a poem by her husband, Korean-War-Memorial designer, Louis Nelson. 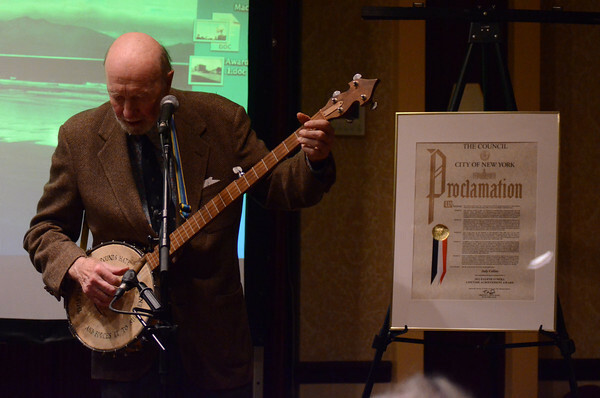 Pete Seeger did not make a speech. 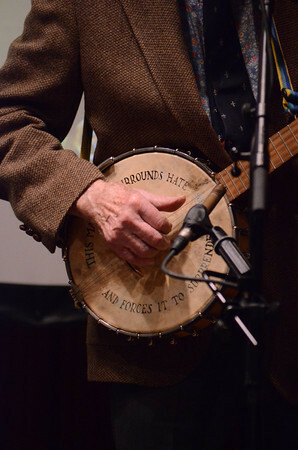 Instead, he strummed his banjo and softly sang, “Quite Early Morning,” about the power of song to inspire the next generation to sing and play and to fight for justice. Seeger’s voice is not as strong as it once was, but his spirit certainly is, and he had a full house willing to join in with him. I don’t know of any “young ones stronger” who can take up Pete Seeger’s banjo when he finally grows too tired to play. 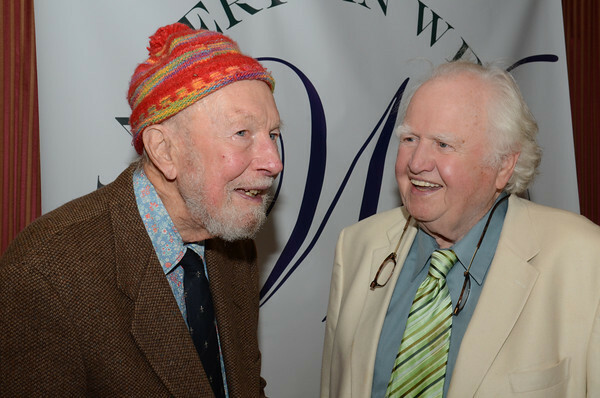 But, perhaps the song did inspire some younger artists listening, as T.J. English suggested the Eugene O’Neill Award has the power to do, and as Peter Seeger has done for decades. 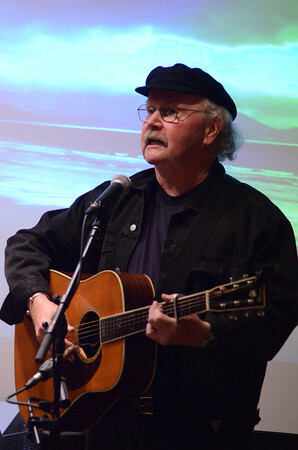 Tom Paxton took to the stage with his guitar, and he did sing “The Last Thing on My Mind.” However, he first sang a song about falling in love simultaneously with a woman and with Ireland. When Paxton did perform “The Last Thing on My Mind,” a song beautifully recorded by Judy Collins, the Manhattan Club crowd sang along with him. Using a slang term, he picked up in Ireland and the U.K., Paxton paid Judy Collins the tribute of dubbing her a true “muso,” or a “lifer” dedicated to the creation and performing of music. Next up was the man that Larry described as needing no introduction, IAWA Co-Director, Malachy McCourt. 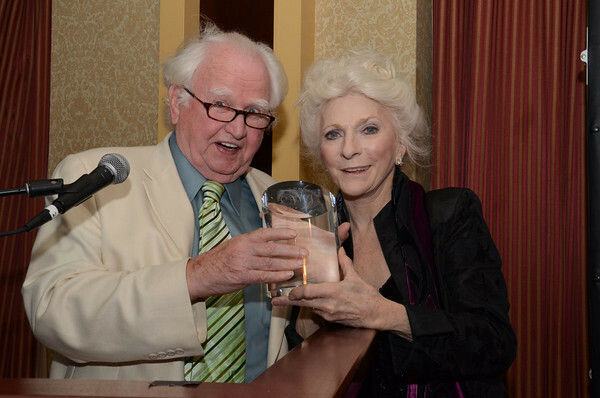 In presenting Judy Collins with her Eugene O’Neill Lifetime Achievement Award, created and donated by Tiffany & Co., Malachy thanked Judy Collins for being a true friend and a treasure throughout the many years that he has known her. He jokingly wished that she would become a Mormon so that she could welcome him as a second husband. To wrap up the ceremony, Co-Director Ashley Davis gathered Pete Seeger, Tom Paxton, and Judy Collins on stage to sing, “Will You Go Lassie, Go?” The audience, of course, was very willing to help out.